We’d love your help. Let us know what’s wrong with this preview of Majority Text by Theodore P. Letis. To ask other readers questions about Majority Text, please sign up. 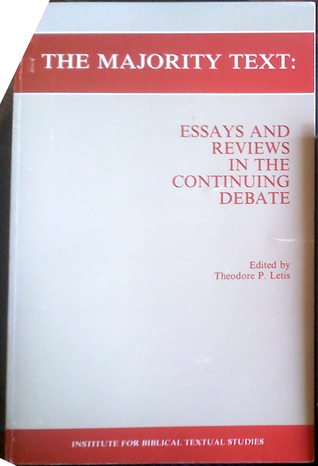 An important collection of essays regarding the Textus Receptus, the Majority Text, the Modern Critical Text, as well as the assumptions and presuppositions underlying each of these positions. The Textus Receptus is preferred. Present textual criticism consider many things in the critical texts as the truth without serious contemplation. I believe any Christian interested in this science needs to hear the voice of the other side. Thought-provoking book. Good. Interesting essays on Beza and Owen amongst other issues.